My rats live in a proper rat room, this is a room made out of half a double garage, with lighting, water and heating. Whilst it doubles as a bit of a utility room visit it and you've no doubt who takes precedence there. The advantage of having a rat room means that I can keep the temperature to a more rat suitable range, the rat room stays above 10 degrees in winter and rarely gets above 20 degrees even in summer. This is far better for the rats than a more human room temperature of 25 degrees. My rat room also has a painted concrete floor, this is easy to clean and more importantly doesn't hold dust like a carpet or rug might. The room has a small opening window and a larger opening window on the door. Both of these are fly screened meaning I can leave them open in warm weather to circulate air and keep the room cool. Thankfully the room doesn't get too much sun so this helps keep it cooler and a nicer environment for the rats. Most importantly it enables me to have a perminant free range area set up. 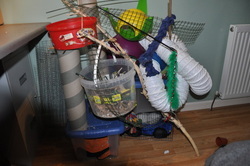 The rats having free run of the whole room as well as an area with lots of fun things and a cat tree to climb on. My main group lives in the 2 bottom sections of my tripple savic royal suite, possibly the best cage out there (in my opinion). I have removed the middle base, to give them the maximum room to climb and explore. Set ups change every clean out, which is usually about ever 2 - 3 weeks, as they need it. The focus is on climbing with lots of branches, ropes and balancing places, as well as a wheel and lots of challenging methods of getting there dinner. If I have older rats in the cage i will try and keep them as challenged as possible whilst helping them get around the majority of the cage. The top half of the SRS acts as a penthouse suit. It is made up as a spare cage permanently for guests, babies or emergency's. When the youngsters are ready to move out of there birthing cage they move into the top half the SRS with lots of things to climb and use. The focus then is on variety of experiences to help them grow confident and neuphilic. Substrate - I use card based bedding predominantly, either a local shredded card or Greenmile as my main substrate, these are shredded cardboard. This is great for digging and scatter feeding as it is springy and bulks out nicely. It also acts as a good cushion should any rat fall and miss the numerous catching hammocks etc I put in to block there falls. This has fair absorption but I find it works a lot better when mixed with hemp (such as Aubiose or Hemcore) or Bedmax. I also occasionally scatter some hay or grass over the surface of the substrate, again this adds variety and the rats seem to enjoy digging through it. Litter - I don’t push litter training with my rats as such, but tend to find they litter train themselves to a certain extent which works well for me. I tend to use back to nature or Paperlit in my litter trays. Bedding – Generally my rats aren't that fussed with bedding but I do usually stick a handful of torn up newspaper, some fleece off cuts, good quality hay or some kitchen roll in there cage. The also get any interesting bits of paper etc. I have lying around, like the odd envelope, brown paper bag or gift wrap I offer nesting females a big range of materials to use in there beds including; kitchen roll, cut up j cloths, entire j cloths, safe bed, tissue strips, cut up fleece and old clothes and some toilet roll tubes (make nice nest edgers). Dry mix – This is the staple of my rats food, offering a balance diet based on a majority of minimally processed grains, I used to mix my own from scratch however now I use a complete straights based mix as my base and add a more varied but still balanced mix to that myself. I generally don’t feed this when they have wet food, unless it’s a small helping then they get a small scatter around the cage, I play this off there weights really, up it if there a bit slimmer than they should, drop it if there putting on a little, it’s quite fluid. 50% Harrisions Bannana brunch, sometimes with some other good complete mixes such as low wheat rabbit muesli's or allen and paige pigmy goat mix. o 10% veg and herbs; boredom breakers herb plus mix (or another nice looking mix), dried cabbage, carrot, beetroot, leek, peas, berries, pepper, tomato etc. o 5% seeds; pumpkin seeds, hemp seeds, linseed, fennel seed, mixed meadow seeds, pine nuts etc. Veg – about twice a week. Now this is usually a mixture of veg, normally with a base of something dark green and leafy, it also usually includes a small amount of fruit. I manage it by getting a load of veg in and then chopping it up and mixing and storing in the freezer. To add variety I have about 3-4 different bags full that have a different combination of ingredients. They quite often get this still frozen too which goes down well. I also look out for mixed veg such as stir fry mixes regularly as this adds a bit of variety in too. Wet meals – this happens between once every week to 10 days. This is normally something wet and higher than normal protein (e.g. dog food, sardines, egg, fish etc. ), something carbohydrate based (soaking mix, cous cous, pasta, rice etc.) and there veg portion. Supplements - As my rats are fed on partially un-enriched straights based food i need to add a few key vitamins and minerals. This means I give them Dr Squiggles Daily Essentials about 2 or 3 days a week, going up to 5 days a week for babies and nursing mums. They also get cooked bones or cuttle fish bones at least once a week. I also add some of the following to there regular wet meals depending what they need at the time (1-2 oils and something full of vitamins as standard); salmon oil, vitamin a extracted cod liver oil, evening primrose oil, omega oil, linseed oil, daily 3, seaweed powder, calcivet, senior aid, glucosamine, some sort of crushed up vitamin tablet (I have copper, vitamin d, calcium and vitamin d, selenium, don’t do this that often really), vitamin C and pro-biotic, bone and meal powder. This then is mashed up and fed in a bowl. Treats – generally a mix of higher protein higher fat every couple of days (fish for dogs small bite kibble, natural cat treats, melon seeds) and low fat low protein (currently curried chickpeas) on a more frequent basis. I up the amount of high protein treats for youngsters or those that look as though they need it. In later life or to support specific illnesses I will often pick treats that may help. To me treats are a useful way of tailoring a diet to the individual, as one rat can get something different to the others (as long as you’re fast dishing them out). 6:15 - 6:40 – I go out to see the rats, they get to come out for a quick morning run around the rat room, they get a bit of fuss and attention too then when I know I'm going to have to go and sort out breakfast for me its feeding time for them. They are well trained so when I get there scoop of food and rattle it they all race back into the cage to get there dinner.